Discussion in 'Edits & Re-Apps' started by Fëanor, Jun 12, 2018. Canon Point: Fëanor has married Nerdanel and is the father of seven sons. Having recently invented a substance called silima, he is working towards his greatest invention. Intelligence & InnovationFëanor's best-known skill enables him to create a variety of inventions for his people. In addition to creating a new writing system in his youth, he has created a new system of lamps, an orb-based remote communication system, and many smaller, beautiful works in his forge. He is considered the best smith of his people as well as a master linguist. His mind works a mile a minute, and he is always coming up with ways to stand out in his chosen fields of study and work. Elven BiologyAs an elf, Fëanor mostly resembles a human, but thanks to his biology, he is immortal and does not get sick or show signs of age. His vision and hearing are superior to a human’s, and he can move more nimbly across difficult terrain. He also does not need as much food and sleep as a human. Physically, although Fëanor is immune to the passage of time and illness, he is not immune to pointy weapons. Any wounds he takes can be fatal if not healed properly. He can also become fatigued and hungry, although it would take more time than a human. First and foremost, Fëanor is extraordinarily stubborn. He refuses to back down for any reason at all, and once he sets his mind to do something (especially if someone says he can't do something), he will not quit until he achieves his goal. Most of his goals are personal and involve ensuring that he is respected and perhaps even awed, and he particularly enjoys being the first of his people to do a certain thing. His creative inspiration plays a large role in his life. Needs like eating, drinking and socializing become secondary when he is working on a new project, which usually means he stays in his forge for days on end, not even necessarily realizing when one ends and the next begins. He has seemingly limitless energy for his projects, and loves brainstorming new to solutions to old problems. When he is not working in his forge, Fëanor spends a great deal of time with his family, and also treasures the few friends who he has. He is too guarded to have a large number of friends, but when he is able to open up to someone, it often leads to a deeply fulfilling relationship. His self-confidence is a paradox of sorts: while he seems to be extraordinarily confident in his interactions with nearly everyone, he suffers from deep self-doubt, often wondering if he is loved and wanted. He has not outgrown his sibling rivalries from his childhood and often seeks ways to trump his siblings, hoping to prove to his father that he is the best of them all. Public perception is important to him as well; he is sensitive to rumors and if he hears something negative about him, he gets outwardly furious but does all he can to fix it. Another contradiction in his personality is that he has an explosive temper, but he is also capable of being very kind and gentle, albeit to those who he chooses to be worthy of this treatment. 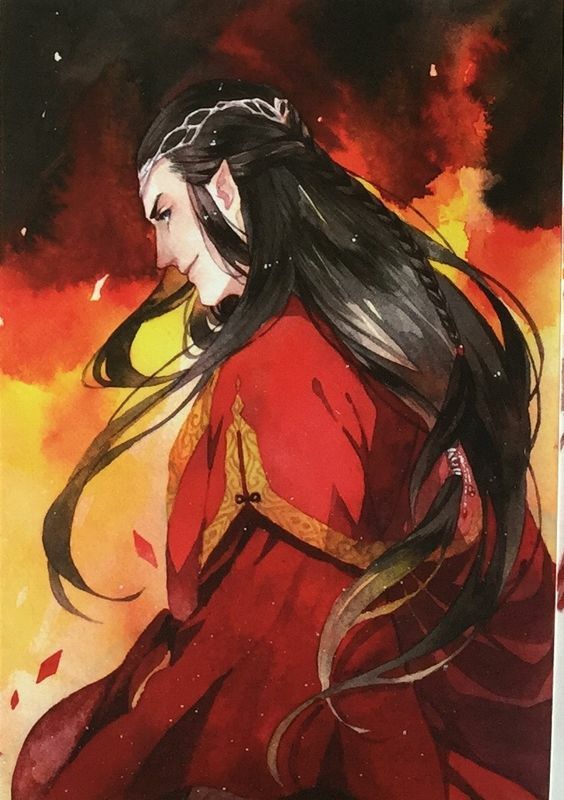 Fëanor was born to Finwë, High King of the Noldor, and his wife Míriel Þerinde after the Noldor elves moved to Valinor. His mother was exhausted by his birth and succumbed to death, a fate unknown by elves up until this point, and the event would affect her son for the rest of his life. His father ended up being the first and only elf to ever remarry, and he had a contentious relationship with his stepmother Indis and her children, especially her oldest son Nolofinwë. He spent most of his time away from his father's home, apprenticing in the forge and beginning the inventions that he later became known for. While he was still young, especially for an elf, he married Nerdanel, and the pair have seven sons. He is a devoted father, although his sibling rivalry plays a large role in how he parents his children. It also drives him to keep inventing more things, hoping to make a name for himself beyond the title he was born with (and often doubts the validity of, given his father's second marriage). Recently, Fëanor began working on his greatest project, an attempt to harness the light of the Two Trees. He sees this as a way to set himself apart and is working extremely long and hard hours to get the job done. With the strange journey to Pandora, he hopes to take advantage of his circumstances and learn even more that he could add to his inventions, using his unique experiences to create something brand new for his people and his world. The boy trailed behind. He was too old to be picked up, too old to sit on laps, and yet the deepest desire of his heart was to do these exact things, if only to keep them away from his young half-brother. They walked along a woodland path, lit by the Mingling. It was later than they would usually go out, but for some reason, Fëanor’s father had wanted to show them something, and “them” now meant Indis, Findis, Nolofinwë, and Fëanor himself, as more of an afterthought than a desired son. He certainly felt that way with Findis hanging off of his father’s left arm and the baby in his right. He held the baby so tightly, cooing over him, responding to every babbled syllable as if he had spoken a sentence. What was wrong with him? Fëanor couldn’t remember anything like that with him; all he could remember was grief, and sitting together in silence, not excursions and fun and actually talking, actually making him feel important. He lingered beside Indis, the cause of all of this, not because he wanted to, but because she insisted on keeping an eye on him. There was no reason for her to want to do this. She had already proven that she cared not at all for Fëanor’s happiness, only that she and her children go to spend time with Finwë, and never once had she and Fëanor had a conversation lasting more than a few terse sentences. Her hand dangled at her side, a silent invitation that both she and Fëanor knew would go unheeded. There was no point in taking her hand, for even if he tried to make a gesture of conciliation like this, his father would never know, and he would never appreciate the lengths to which Fëanor was willing to go for a little bit of his time and affection. In its absence, he watched. He kept his eyes fixed on his half-siblings, the little giggling Vanya girl who reminded Fëanor so much of her mother and the small dark-haired baby boy whose mere existence felt like a stab to Fëanor’s heart. Every bit of love that was his, every demonstration of affection, Fëanor felt as though it had been stolen from him, and the feelings rotted in his heart without anyone even knowing. Indis likely thought he was simply a surly child, and while he interacted with her to the bare minimum, he felt no need to make obeisance to the baby. There was no reason for him to want to hold the little one, to talk to him. He got enough love and attention already. The little girl was less of a threat to him, so he would occasionally speak with her and play with her, but it was moments like these when he wished she was not in his family, for the simple joy in her heart was so oppositional to the fire in his that he felt as though she cheapened all of his problems. “Are you well, Fëanor?” Indis suddenly asked, and it was almost strange to hear her speak his name. “I am well, stepmother,” he replied, for he could still not convince himself to call her queen, no matter how much his father had implied (and point blank stated) it would mean a great deal to him. He wanted to tell his father that he had been promoted, that he was now a senior apprentice to one of the finest smiths in Valinor at such a young age, but he would hate to have the moment ruined by something like this, by his father swinging little Findis into piles of leaves and her little giggles making the baby laugh too, his chubby fists waving in the air. “It is going well,” he answered truthfully, and wondered if he would ever tell his father that he had been promoted. Or would he simply wait, he wondered, for an occasion to present him with some grand project or another, perhaps even in a group? Would he wait long enough that it no longer mattered, that his age and skill were no longer exceptional? He had not even told his father that he had met Aule, that he had encountered the greatest smith, and he had praised his work, which made the boy feel more than he had felt with his father in such a long time. “Are you working on anything new?” Indis asked, and Fëanor internally groaned. He hated these forced conversations in which Indis tried to act like she knew him, like she was not the instigator of everything that had ruined his life. There were those now, he knew, who said that the Valar sanctifying Finwë’s second marriage made his first illegitimate, and that little Nolofinwë, whose name still hurt Fëanor every time he thought about it, was the proper heir to the High Kingship of the Noldor. The child was still a baby, but Fëanor knew that he would rather die than let him ever become king. “Nothing in particular,” he lied, not wanting to extend the conversation any further. He wondered if his father heard anything he had said, was curious about anything. It seemed like Finwë almost never sought him out anymore, whether it was in his room or anywhere else. It was just another painful sign that Nolofinwë had stolen more than his potential birthright, but his father’s love as well. Fëanor wondered why she was saying this. Had she been prompted by Finwë? Or was she trying to actually reach out to him? There was no way to tell, not without significant probing, and he had no great desire to get into a fight with her in the middle of what was supposed to be a nice family walk for Finwë’s second family. He wondered why he had even been invited; why he had not tagged off with some sort of excuse. theweasleyboys, Piper, Nessa and 2 others like this.